After the Oscar glam, Miranda Kerr still managed to pull out a beautiful look for the Victoria’s Secret Fabulous collection event on February 26. She was in a sunny yellow one-shouldered dress with blue ankle-strap Brian Atwood heels. 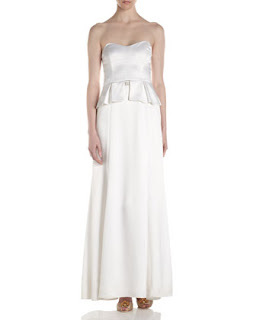 Get a similar look with the Shoshanna $105 One-Shouldered Ruffle Dress. Irina Shayk must have been feeling in a light colour/low-cut kinda mood when picking her outfits this month. Out before the Oscars, she was in a white low-cut dress, and her Oscar night look had an even riskier neckline. Despite the lower neckline though, the Stephane Rolland dress had a lot more fabric - featuring ruffles and folds at the front. 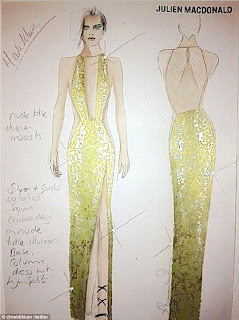 Before making an appearance herself, Heidi Klum showed a sketch of her Oscars dress on Twitter and even it was a "wow!". Heidi was stunning in the low-cut gold Julien Macdonald design that featured mesh insterts, intricate beading, and a gold Brian Atwood shoe revealing slit. Get a similar look for less with Haute Hippie's Gold Sequin Deep-V Dress which is on-line at Rent the Runway, so you too can feel all Oscar-worthy for a night! She had previously told People.com she didn't know how she'd wear her hair until the dress arrived, and she opted for a complimentary swept-back look. Lorraine Schwartz jewels completed the gorgeous look. It's usually a jeans and boots combo in her candids but Kate Beckinsale proved she looks just as stunning in a dress, attending the Vanity Fairy Oscars event in her black Monique Lhuillier dress that was beaded with what looked like mini gold fireworks. Kate wore the dress with Jimmy Choo sandals, Chopard jewels, a Roger Vivier clutch bag, and high ponytail. If there was an award for Oscar Night's best couple - Nina Dobrev and Ian Somerhalder would definitely be the winners. The pair were at Elton John's AIDS Foundation Academy Awards viewing event last night (February 24), looking fab in co-ordinating black and white. As usual with Nina, she kept her hair simple, opting for a sleek ponytail to go with her Naeem Khan dress. She's petite and fairy-like in stature so the Tinkerbell hairdo was a perfect fit for Kristen Chenoweth. The red carpet host's Academy Awards gown was no cute pixie dress though, instead, she went for dark glamour in her sweeping black Tony Ward Couture dress that was topped with silver sparkles. Nicole Kidman managed to combine what ended up being two of the Oscar red carpets most popular colours in her black-and-gold L'Wrenn Scott design. A soft updo with tumbling tendrils, and Fred Leighton jewelry completed her look. Winner of the Best Supporting Actress Award, Anne Hathaway, kept it sleek and simple, and maybe just a little Audrey-like for her Oscars look. She wore her pale pink satin Prada dress with glam jewels, and a smooth, polished 'do. 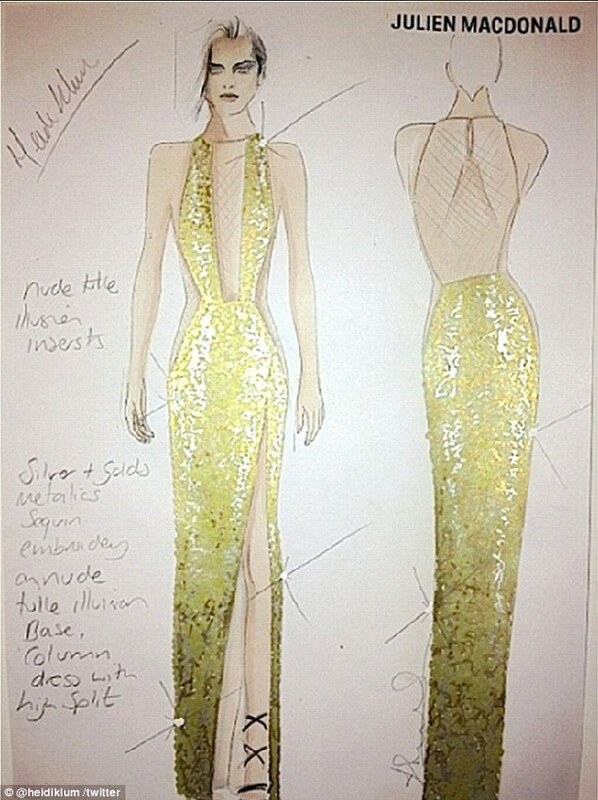 Catherine Zeta Jones opted for Oscar gold in her sequined Zuhair Murad design for this year's Academy Awards. Her glossy dark hair and gold Lorraine Schwartz earrings were perfect accompaniments for the sheer-hemmed gown. Get a similar earring look with the Heirloom Finds Luminous Matte Gold Hammered Chandelier Earrings , which are just $9.99 at amazon.com. Kristen Stewart had to have a crutch as her Oscar night accessory after stepping on glass, but she still managed to look fab. She opted for a creamy lace and tulle Reem Acra design that would have been all princess-y glam had it not been for K-Stew's usual low-key hair and make-up style. She did however have some Fred Leighton jewels to complete the look. It's been a few years since she got her Oscar but Reese Witherspoon (presenting at this year's Academy Awards) was still a winner in her royal blue dress and regal waves. The Louis Vuitton gown featured illusion-creating black panels, and a cute bow. Reese said: "My daughter and I picked it out. She said, 'This is a winner'" exclaimed Reese. It's always been about classic, simple shapes with Jennifer Aniston so her strapless Valentino gown choice was no surprise - but the colour certainly was! Jennifer stood out in the red dress that was teamed with a matchy red clutch. 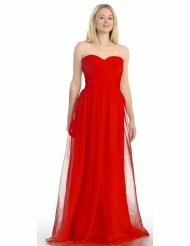 Get a similar red red-carpet-worth look with the $114.99 Red Strapless Chiffon Dress. Her best accessory though was fiance Justin Theroux - looking all dapper in her Ferragamo suit. Whether it was pre-planned or not, Renee Zellweger was a good match for her Chicago co-star, and on-stage co-performer Catherine Zeta Jones at the Oscars last night (February 24). Both were in gorgeous gold designs, Zuhair Murad for Catherine, and for Renee she stuck with fave Carolina Herrera, plus a simple up-do. Turning her Mad Max-crop blonde gave Charlize Theron a fresh new look for the Oscars on February 24. The upcoming movie was filmed in South Africa and Charlize showed off the tan she got in the white strapless Dior design and bronze glow-enhancing Harry Winston jewels. OK, now this isn't exactly that much like Charlize's, but for under $60.00, you can't complain at this White Laundry Peplum Maxi Dress for a style steal for her Oscars look. Sandra Bullock was another of the Oscar attendees to opt for black but kept her look from being too sombre thanks to the Elie Saab dress's sheer underlay, and the glittering Harry Winston hair jewels worn in her hair. Accessories were a vintage Daniel Swarovski clutch, and Jimmy Choo shoes. Get a similar glam hair clip look with the $14.99 Clear Crystal Leaf Hair Clip. Irina Shayk showed off her fab model bod' in a low-cut white dress while attended an event in Hollywood on February 23.
rina teamed the white plunge-front dress with black Christian Louboutin "Pigalle" point-toe heels, and matching black clutch bag. They make just as good a couple off-screen as they do on, but Once Upon a Time's Snow White opted for bright red at the Costume Designers Guild Awards in Beverly Hills. Ginnifer Goodwin and Josh Dallas were presenting at the awards, and Ginny looked fab in her Misha Nonoo gown that featured sheer inserts around the hem. Also at the the Chanel Pre-Oscars event, they co-ordinated in navy blue - Ginnifer in a chic Chanel jumpsuit with black Chanel handbag too.